Vidya Balan is all set to share screen space with co star Emraan Hashmi for the third time under the Bhatt camp. Mahesh Bhatt has chosen Vidya for his upcoming film ‘Humari Adhuri Kahani’. ‘The Dirty Picture’ actress Vidya Balan is all set to share screen space with co star Emraan Hashmi for the third time under the Bhatt camp. 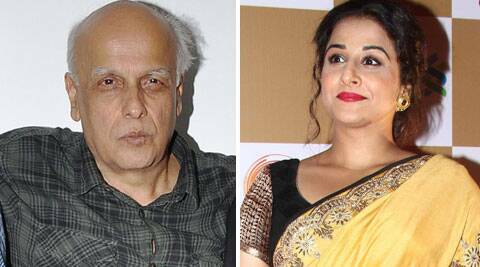 Filmmaker Mahesh Bhatt has chosen Vidya for his upcoming film ‘Humari Adhuri Kahani’. While the film was slated to go on floors in May – June this year, it has now been postponed to October. Mukesh Bhatt earlier said that the dates have been shifted to October owing to illness of the film’s lead actor Emraan Hashmi’s son. Emraan’s four-year-old son Ayan was recently diagnosed with a kidney tumour and was undergoing treatment in Canada. ‘Hamari Adhuri Kahani’ is reportedly based on Mahesh Bhatt’s life. Directed by ‘Aashiqui 2’ director Mohit Suri, ‘Hamari Adhuri Kahani’ will also star Rajkumar Rao and will be produced by Fox Star Studios and Vishesh Films.